Rapid- Complete anaerobiasis in less than 3 minutes for unmatched organism quality and recovery. Cost efficient- Anoxomat low gas consumption, maintenance and minimal operating consumables ensure its return on investment over chambers and gasbags. Quality Assurance Program- Performs leak tests, gas input test and confirms catalyst activity BEFORE incubation. Data record- Optional User Traceability Program to document user ID, gas mixtures and patient information. Automatic, one-button operation- Process jars while you continue to work and increase your laboratory’s efficiency. Superior environments- Other methods are marred by disadvantages such as late discovery of faulty jars and gas packs, slow anaerobiasis and chemical waste. Compact design- Large footprint chambers take up valuable lab space. Anoxomat is no bigger than a small microwave oven. TRCReady®-80: The TRCReady®-80 is designed for fluorescence measuring applications in constant temperature to detect specific target RNA using Tosoh designated TRCR reagents. This combination of two technologies- TRCR reaction and INAF probe- achieves real-time, one step, rapid and efficient detection of RNA. 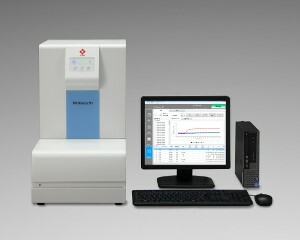 Easy and Fast- Fully automated sample purification, amplification and detection in 40 minutes. Two modules can be combined. Automatic assessment of measurement results. TRCReady®MTB Kit: Rapid detection of M.tuberculosis complex for better patient management and outcome. Reliability-16S rRNA target, internal amplification control, amplification and detection step in a sealed tube minimizing contamination.